Professional services need to move past using the funnel as their only model for customer acquisition. It simply no longer accounts for the fluidity of the modern consumer market. I knew that the funnel had dominated marketing for a long time. Exactly how long that had been the case for, however, I wasn’t aware of until I started researching this article. It has been 120 years since the funnel was invented in New York by Elias Lewis, an early American advertiser. That’s an incredibly long time. When the model was invented, the US was at war with Spain and Queen Victoria sat on the throne. Funnels are great and they accurately represent a customer’s journey towards a purchase in many cases. However, in 2018 there’s a lot that they don’t account for. Technology has fundamentally altered how people make purchasing decisions to the extent that even a model as solid as the funnel looks redundant. The purchasing funnel assumes a linear path from awareness to consideration to purchase. Nowadays, however, customer trajectories are far from straightforward. People are using their devices to constantly research, sometimes going on several purchasing ‘journeys’ before coming to a decision. Pioneering research from Google, which looked at thousands of users’ clickstream data, found that no two customer journeys are alike. Even within the same sector, customer journeys take incredibly different shapes. Customers’ ability to do literally endless research means that they might spend months or even years on a journey before coming to the point of making purchasing decisions. Trust (in politicians, marketing, companies... everyone really!) is at an all time low, so it’s no surprise that customers want to do as much research as they can. For instance, a customer interested in buying a new stereo system could spend months researching different hi-fis out there, before deciding that poor sound insulation in their flat means that investing in some good headphones would better satisfy their needs. Alternatively, another customer might not initially be interested in buying headphones but then see an appealing online offer and come straight to a purchasing decision, sliding down the funnel in a matter of seconds. The same goes for people considering professional services. They will look at any number of potential options and really do their research before coming to a decision. This sort of behaviour doesn’t really fit into a funnel model. Customers may have literally hundreds of touchpoints with different firms before coming to a decision. Things are too dynamic for the funnel to accurately reflect. As much as the funnel can be a great way for businesses to understand how they attract clients, where it really falls down is when it comes to explaining how existing customers generate more clients. In a world where 3.5 billion people use the internet, you’d think that digital people would mostly make buying decisions based on what they read online. Word of mouth remains a massive driver of company growth. A 2016 survey by Nielsen found that a whopping 80% of Americans seek recommendations before coming to a buying decision. Factor in that consumer trust is rapidly vanishing and you can really see why people are relying on their friends’ and family’s ‘word’ before making a purchase. Recent new stories such as the Volkswagen emissions scandal and numerous well publicised company data losses mean that customers are somewhat more reluctant to rely on companies for unbiased information than they were in the past. In this climate, continually delighting customers is the best way to generate momentum for services companies. It goes without saying that an emphasis on delighting customers and prospects is nothing new. I’m sure that a focus on delight has formed a part of business activities ever since the first shops were opened. However, it has never been more important than it is now for companies to focus on delighting. You need to assist your customers and prospects whenever they might need it. Having helpful content that quickly answers your prospects’ and customers’ common concerns is a must. Across all your touch points you need to think about how can you optimise them to maximise delight and word of mouth referrals. Whether this means coming up with a structured onboarding process or just really being there for your clients, try to align your points of focus with your overall brand and operations. So now the funnel is redundant, is there any kind of model to replace it? At #INBOUND18, HubSpot’s CEO Brian Halligan explained the flywheel and why it’s a powerful new model for growth. Flywheels are an interesting metaphor to use for growth generation because they represent a circular process where customers drive growth and friction slows them down. What’s more, the weight and composure of a flywheel affect how fast they spin. Whereas the funnel focused on moving customers down the funnel, the flywheel focuses on generating momentum. Reducing friction and spinning the flywheel faster is the name of the game. This means you need to identify the points where prospects and clients can become ‘stuck’ when using your service and work to make them seamless. 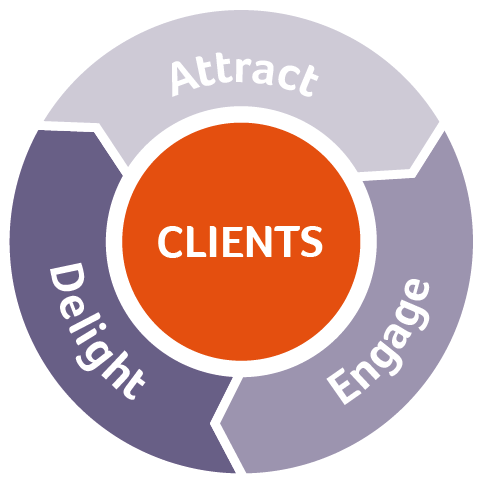 It really puts the client at the centre of your marketing strategy. This is the brand awareness, the outreach at the start of the buyer journey. This involves attracting those who don’t know you from the rest and starting to build a relationship with them. The client experience. Delight clients and more will follow. Make the experience as ‘light’ and as frictionless as possible. Being over-attentive could add friction and cause you to lose momentum. This is about building lasting relationships with clients by providing insights and solutions to their problems. The momentum your flywheel carries increases the most by applying force to the areas that have the greatest impact. The faster you spin it, the more your business grows. In the traditional funnel model, most of the marketing effort was concentrated at the top of the funnel. With the flywheel, things are more dynamic. Pressure is directed where it can have the most impact on your company’s growth. Jon founded ClientsFirst in 2010, having previously worked in both plc and SMEs. Having started in what he describes as a ‘broom cupboard’, Jon has grown ClientsFirst from the ground up and continues to take an active role in both our own marketing and that of our clients, as well as setting the strategic direction of the business. Jon’s most difficult ‘management’ task away from the office is keeping three young offspring busy but, when he’s not doing this or anything related to ClientsFirst, he heads out into the great outdoors, with tennis, golf and running the occasional half-marathon amongst his hobbies.